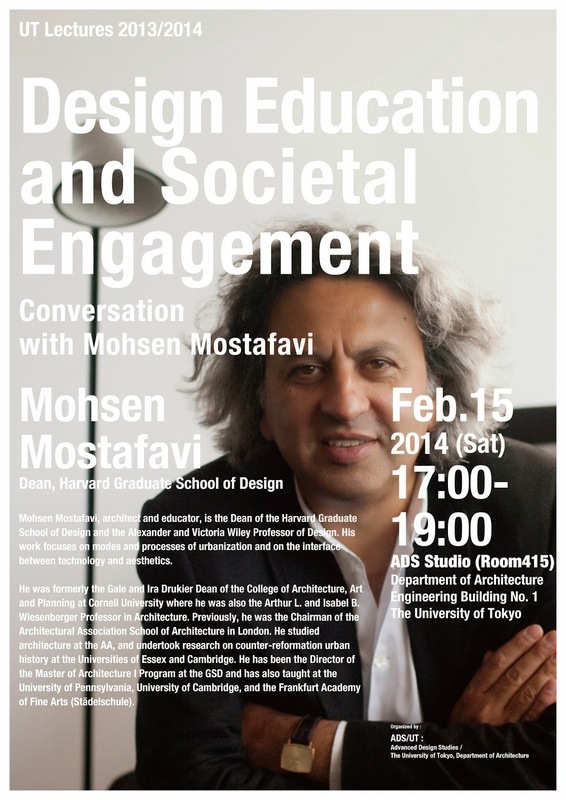 Mohsen Mostafavi will give a lecture titled Design Education and Societal Engagement at Obuchi Lab this Saturday, 2/15 from 5:00 PM. The lecture will be followed by discussions with students and teaching staff. Mohsen Mostafavi, architect and educator, is the Dean of the Harvard Graduate School of Design and the Alexander and Victoria Wiley Professor of Design. His work focuses on modes and processes of urbanization and on the interface between technology and aesthetics. He was formerly the Gale and Ira Drukier Dean of the College of Architecture, Art and Planning at Cornell University where he was also the Arthur L. and Isabel B. Wiesenberger Professor in Architecture. Previously, he was the Chairman of the Architectural Association School of Architecture in London. He studied architecture at the AA, and undertook research on counter-reformation urban history at the Universities of Essex and Cambridge. He has been the Director of the Master of Architecture I Program at the GSD and has also taught at the University of Pennsylvania, University of Cambridge, and the Frankfurt Academy of Fine Arts (Städelschule).